Scrumptious little treats, full of the natural sweetness of cinnamon and coconut. 1. Preheat the oven to 180°C and line a 12-hole muffin tin with paper cases. 2. Beat the eggs, melted butter, stevia, and vanilla in a large bowl until well combined. Add the remaining ingredients and mix well to form a thick batter. 3. Spoon the batter evenly into the paper cases and bake for 40–45 minutes, or until a toothpick inserted into the centre of a muffin comes out clean. Set aside to cool. 4. To make the frosting, put everything in a food processor and blend until smooth and creamy. Transfer the mixture to a piping bag or zip-lock bag and place in the fridge to firm up slightly. 5. 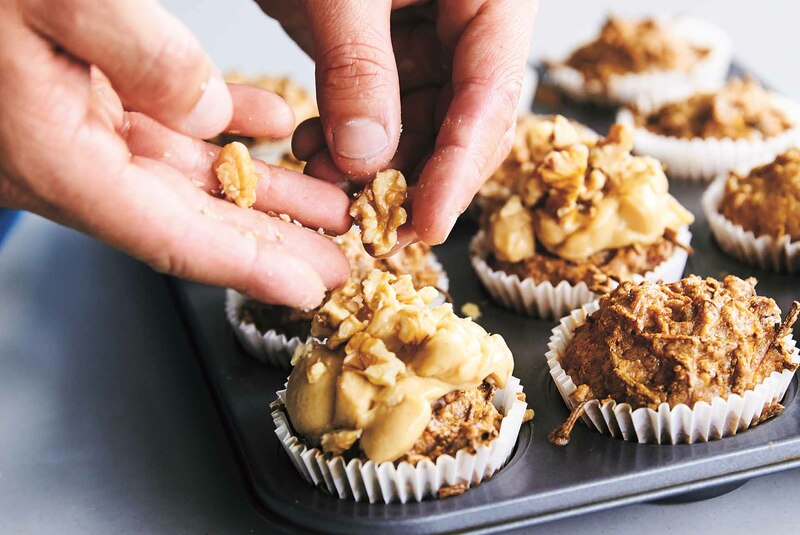 Once cool, cover the muffins generously with the frosting and finish with a sprinkling of crushed, toasted walnuts, if you like. Enjoy straight away or transfer to an airtight container and keep in the fridge for up to 7 days or in the freezer for up to 3 months. Recipes and images extracted from Smart Carbs by Luke Hines, published by Plum, RRP $39.99. Available in all good book stores. Luke Hines, The Clean Living Cook, is all about celebrating real food that tastes phenomenal. What are the health benefits of nuts?